This Anglo-Saxon name is of locational origin from a place thus called near Morecombe in Lancashire. Recorded as Hessam in The Domesday Book of 1086, and as Hesham circa 1190, in Lancashire Charters, the place was so called from the Old English pre 7th Century "haes", corresponding to the Law German "hees", "hese" meaning brushwood or underwood, plus the Old English "ham", (Law German "hamm"), a flat low-lying meadow. 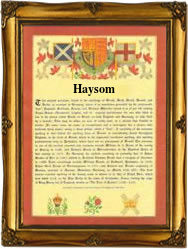 The surname, under the variant spellings Hesome, Haysom, Heisham, Haysham etc., is particularly well recorded in church registers of Northern England from the late 16th Century. On July 7th 1589, William Heisham, an infant was christened in Warton near Lancaster, and on May 19th 1629, Gyles Heysham and Anne Occleshawe were married in Ormskirk. William and Robert Heysham of Lancaster became eminent merchants in London, and both served in several parliaments during the period 1702 - 1727. The first recorded spelling of the family name is shown to be that of John Heyson, which was dated 1300, in the Calendar of Letter Books of the City of London, during the reign of King Edward, 1272 - 1307. Surnames became necessary when governments introduced personal taxation. In England this was known as Poll Tax. Throughout the centuries, surnames in every country have continued to "develop" often leading to astonishing variants of the original spelling.